Twilio PHP API for sending SMS-OTP Tutorial & Example. - The Code City Twilio PHP API for sending SMS-OTP Tutorial & Example. Twilio provides a set of web APIs that enabled users to use standard web languages to build VoIP, voice and SMS apps via a web APIs. Get SID and Token from Twilio. Set up Twilio PHP SDK using composer. Create a Twilio Client using PHP to send SMS. 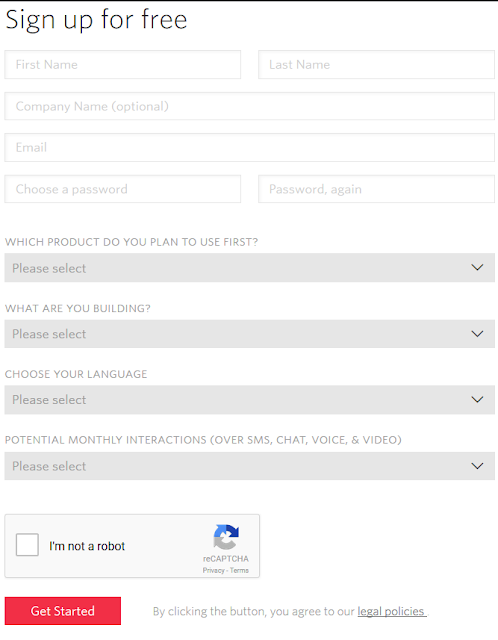 Enter you name, password and select I'm just exploring in the question where you need to select which product do you plan to use. Select phone verification for the question "What are you building", select PHP as the language and finally select not a production app for the "Potential Monthly Interaction" question. After that you need to enter your phone number so that they can verify you. Enter you real phone number as a code will be sent to you for verification. Enter the code that you receive, you are now required to create a project name. Name the project SmsVerification, and click done. The account creation is now complete, you should be able to see your project console. You can see you Account SID and Auth Token on the first visible page in the console. The console looks like the image below, you can see the SID and Auth token blurred. Once you have your Account SID and Auth token, next we will set up the Twilio PHP SDK. After you hit enter, you'll be asked several things like author, minimum stability and some other project information. You can leave it as it is and just press enter through the options until it asks do you want to resolve dependencies interactively? You need to type n meaning no for that option. You'll be able to see Twilio SDK being downloaded and set up. After the process has been successfully installed, there will be a vendor directory created with a twilio directory with several other files and directories inside it. Now we are ready to code. //Use the client to do fun stuff like send text messages! NOTE: The from is a phone number that you will need to purchase in your twilio.com/console. Remember that you cannot send SMS with test SID and AUTH token even if you have purchased a phone number. You need actual production sid and token with the number that you bought for the SMS to be sent to an actual number. That's it, this is all that is required for using the Twilio API for message sending, you can use this for OTP verification, SMS notifications and much more. It's pretty straight forward, if you have any problems feel free to put them in the comment section below. Happy Coding!